Sean Martin at court August , 2018 and in inset. 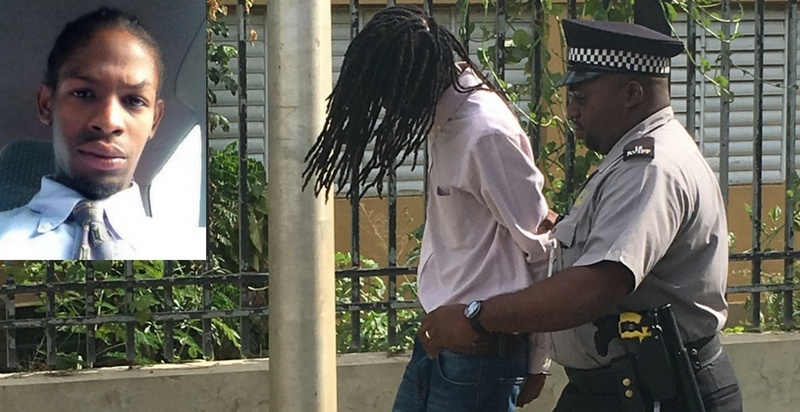 Sean Martin was not required to plead when he appeared in the Magistrates Court on Monday, August 27 to answer to the accusation of gunning down Jerry Castro-Felix on August 10. After the charge of murder was read by Magistrate Hakim Creque, the allegations against Martin, a 27-year-old Johnson’s Ghut resident was outlined by Principal Crown Counsel Tiffany Scatliffe-Esprit. It was reported that on August 10, the deceased Castro-Felix went to a building in Purcell Estate referred to as Connie Apartment, which is across the street from the One Mart warehouse. The court heard that the deceased was hanging out with friends which is something that he often did. According to the Principal Crown Counsel, at around 7:45 pm Castro-Felix was sitting talking to friends with his back to the side walk. It was stated that one friend allegedly said they saw an unknown man acting suspicious. The court heard that moments later Castro-Felix was shot in the head. Police were summoned to the scene and upon arrival found the body, which had what appeared to be a head injury. A doctor later declared Castro-Felix dead; and it was reported that police recovered a spent shell from the scene. According to the allegations, witnesses said they saw a slim-built tall man wearing a grey hoody in the vicinity around 7:45 pm. It was further alleged that, other witnesses said they saw and recognized the accused in the area dressed in the same manner described. Additionally, it was noted that CCTV footage showed someone fitting the description in the area close to the time. As a result of the investigation the accused was met at his workplace in Road Town and told of the report. The court heard that police investigations also revealed a conversation where it was alleged that the defendant was planning an alibi. During the police interview Martin denied committing the crime. A reporting date was set for September 21, following which there would be a paper committal. Martin was remanded to prison. Jerry was a very nice person and a friendly young man, he didn't deserve to go like that. I am not saying is martin kill jerry because i don't know who did it. But if he did, he deserve life in prison. This guy has ruined his entire life, that of the victim, the victim's family and his family. When reality set in his conscience will take over.